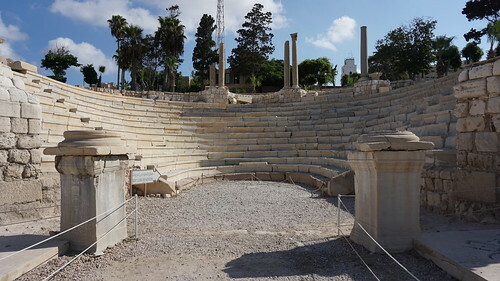 The Roman Amphitheatre we see today in Alexandria was constructed in the 4th century AD and it was a common feature of the Greco Roman period. Amphitheaters were special roofed theatres that were built to host music ceremonies and poet competitions during the reign of the Romans in Egypt. The amphitheatre features a marble audience section which is symmetrical with extended wing and could host up 600 spectators. There were also five compartments at the top of the audience section used to host important figures and wealthy tradesmen during performances. These compartments once had ceilings with domes that were based upon large columns made of granite to protect the audience from the sun and the rain. Moreover, these domes were used to magnify the sound of the music and the chants during different performances. Unfortunately, all these structures were destroyed during the earthquake that hit Alexandria in the 6th century AD and resulted in the damage of many important structures at the time, like the famous Pharaohs Light House that once stood in the position of the Qaitbey Fort today. The steps and the rows of the Roman Amphitheatre are based upon a thick white limestone wall and another wall surrounds it as well. These two walls were connected together through a number of arches where the outer wall function to support the inner wall, a common feature of the Roman architecture from the 2nd to the 4th century. In the middle of the structure, there is the section of the orchestra where the musical performances used to take place. This section is supported by two large marble columns and has some of the finest Roman mosaics on its floor.